The epic of Chicago is the story of the emergence of modern America. Here, witness Chicago's growth from a desolate fur-trading post in the 1830s to one of the world's most explosively alive cities by 1900. 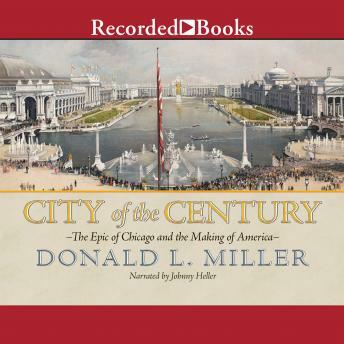 Donald Miller's powerful narrative embraces it all: Chicago's wild beginnings, its reckless growth, its natural calamities (especially the Great Fire of 1871), its raucous politics, its empire-building businessmen, its world-transforming architecture, its rich mix of cultures, its community of young writers and journalists, and its staggering engineering projects -- which included the reversal of the Chicago River and raising the entire city from prairie mud to save it from devastating cholera epidemics. The saga of Chicago's unresolved struggle between order and freedom, growth and control, capitalism and community, remains instructive for our time, as we seek ways to build and maintain cities that retain their humanity without losing their energy. City of the Century throbs with the pulse of the great city it brilliantly brings to life.